This remarkable painting is actually a gigantic "pen work," an ink-on-canvas drawing transfigured by rosy touches of oil paint. The source of illumination in the painting—Cupid's torch—is also the focal point of the narrative. The flame rouses Venus, the goddess of Love, from a deep slumber. Two satyrs offer her grapes and fruits of the harvest, illustrating the painting's title theme: without food and wine, love cannot flourish. This ancient Roman theme was extremely popular in Holland at the turn of the seventeenth century. This painting's exalted pedigree reflects its importance. It was in several royal collections, including those of Rudolf II, the Holy Roman Emperor who had his court at Prague through the early years of the seventeenth century; Queen Christina of Sweden, whose troops looted Prague in 1636 and absconded with innumerable art treasures; and Charles II of England, where it remained until at least 1720. Cupid's flaming torch is the source of illumination in Hendrick Goltzius's acclaimed "pen work"; it is also a focal point of the narrative and the locus of Goltzius's own great technical innovation in this painting. Venus, the goddess of love, awakens from a deep slumber, roused by the flaming torch held by Cupid. Two satyrs offer her grapes and other fruits of the harvest, illustrative of the theme that without food and wine, love cannot flourish. 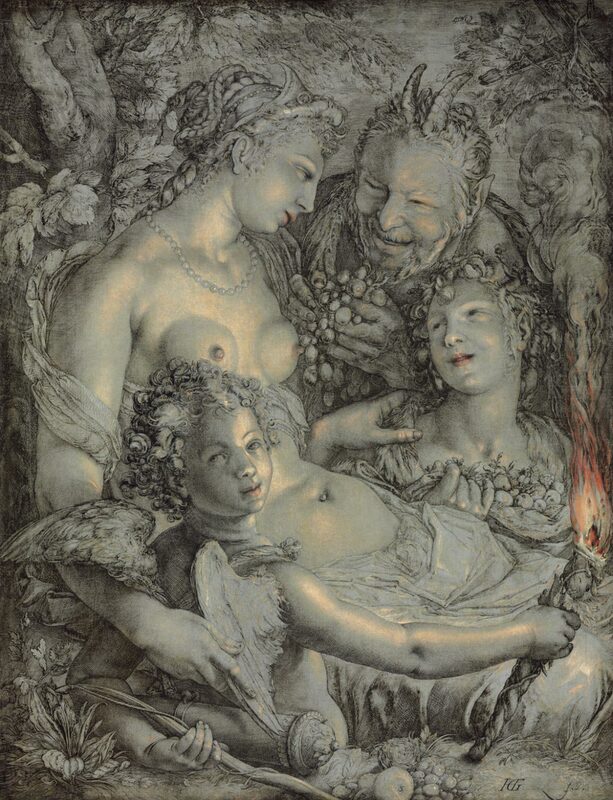 Goltzius's large painting on canvas was meant to imitate a pen drawing made gigantic yet it is a drawing transfigured by touches of rosy paint in the areas of the illumination cast by Cupid's torch. The importance of this masterpiece of northern Mannerism is reflected in its exalted pedigree. It was in several royal collections, including those of Rudolf II the Holy Roman Emperor, who had his court at Prague in the early seventeenth century; Queen Christina of Sweden, whose troops looted Prague in 1636 and absconded with innumerable art treasures; and Charles II of England, where it remained until at least 1720. Katherine Crawford Luber, from Philadelphia Museum of Art: Handbook of the Collections (1995), p. 172.